Olivetti Suma Prima Sterling add-listing machine. 6 £ digits, shillings, and pence. 240 mm wide, 340 mm deep, 135 mm high (9.5" x 13.5" x 5.5"), 4.5 Kg (10 lbs.). Note - By setting the left switch to "WN" the machine operates with Whole Numbers only using just the £ digits. Olivetti add-listers like this were very successful in the UK., and a number of models were sold over the years, both hand-operated and electrically driven. The control knob at top right on this machine has four positions, away from its neutral centralised position, which produce the operations shown in the diagram on the left. For information on the difficulties of multiplying with a machine like this see the article "Sterling Currency (£sd) Multiplication on a 12-key Add-Lister". 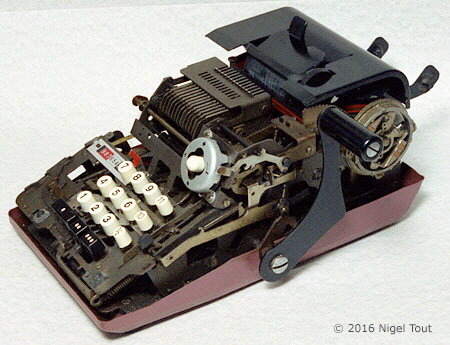 Olivetti Elettrosumma 22-R Sterling "10-key" add-listing machine. 225 x 380 x 195 mm (9" x 15" x 8"). This machine is for use with the British £sd currency and has 1/4, 1/2, 3/4, 10, and 11 pence keys above the normal 10 keys. The additional complication of the mechanism for a £sd machine must have caused the designers a considerable headache. The black keys with the white spots enter the same number of zeros as the white spots. 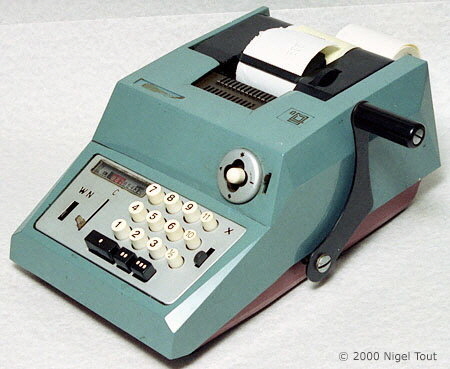 The Elettrosumma 22 was introduced in mid-1958, claiming "With a speed of 210 cycles per minute the Elettrosumma 22 is the fastest adding/listing machine yet produced." It was priced at £89 15s Sterling [about US$250]. From The Manager, May 64 - "Priced at £69 15s [Sterling (about $195)].... ... it totals up to one farthing under £10m. The machine also subtracts, multiplies by repeated fast addition and has what is described as a "static memory". This allows an amount to be held on the keyboard through a total or sub-total." Inside is a 3-D maze of mechanical components. 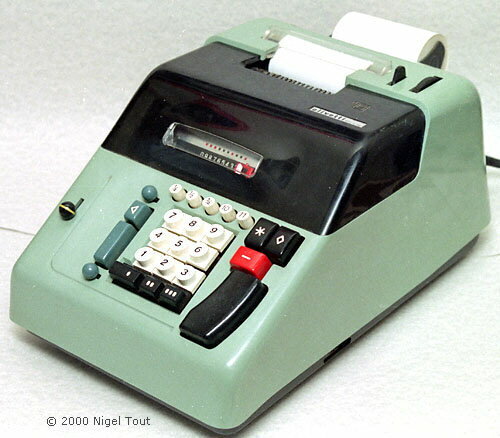 Olivetti were great proponents of small, elegant 10-key mechanical adding machines and calculators. Their first adding machine, the "MC 4S Summa" was introduced in 1940, using pressure moulding, followed in 1941 by the "MC 4M Multisumma". "The story of Olivetti is no less than the story of Italian industrial design. At one time or another every great Italian designer has worked in some capacity for the company... ."
"Mario Bellini (b. 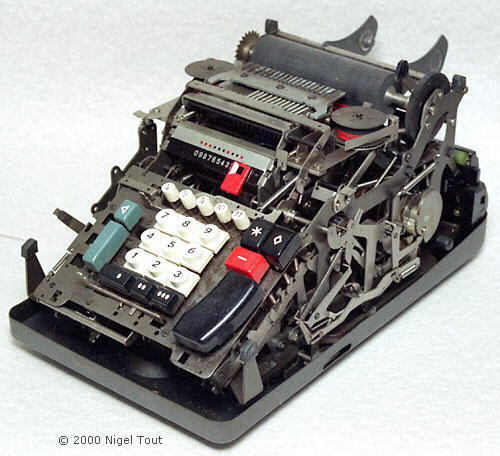 1935) ... has collaborated continuously with Olivetti since 1963, working on their entire product range. Bellini's chief work for Olivetti has been the 'Programma' microcomputer (1965), the 'Logos' and 'Divisumma ' calculators (1973), ..."
"One of the greatest of all product designers, Marcello Nizzoli (1887-1969) was the first and most influential of designers to work for Olivetti, ... ... He went on to design a series of machines which have become 'classics' of modern industrial design: ... and the 'Divisumma 24' (1956)." "Production Line - Add-listing Machine", The Manager, May 1964, p70. Stephen Bayley, ed., "The Conran Directory of Design", 1985, Octupus Conran).